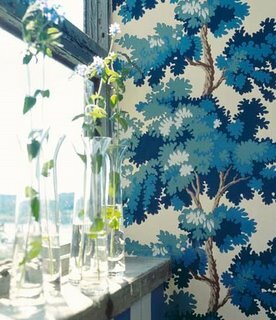 I have been swooning over a few wallpapers recently. 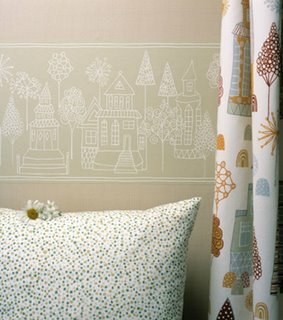 Here are a few.This is a new one for Sandberg whose fabrics I have loved for so long. They are a Swedish company (but of course they are). This one is also by them which is a bit safer and although the colour is very subtle it still has a real charm, of course I love the little houses and the fabric is great too. This one is for Graham and Brown. I have worked closely with them for a few years now and they have reproduced some of my designs for sale internationally as wall art rather than wallpaper but here are two of their wallpapers that I love. 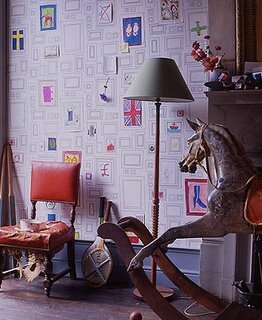 'Pink donkey' is designed by Kate Larsen, this interactive paper rekindles the joy of the old parlour game, pin the tail on the donkey. 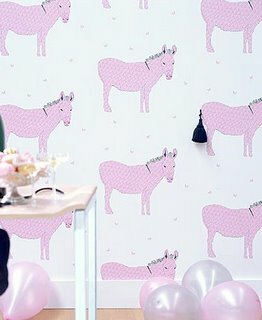 You decide what the tail will be then attempt to pin it on the pink donkeys. And finally my absolute favourite is 'frames'. I have some rolls of this myself which they gave to me one day when I was up in their warehouse proofing my own designs. I have never got round to putting it up though. I am saving it for when we do eventually buy our own house. It is far too good for rented accomodation. Designed by artists Taylor and Wood again is interactive. You can add photographs or draw straight onto it, I will have hours of fun with this though one day. ..how fab that you work with Graham and Brown, that must be amazing...! !